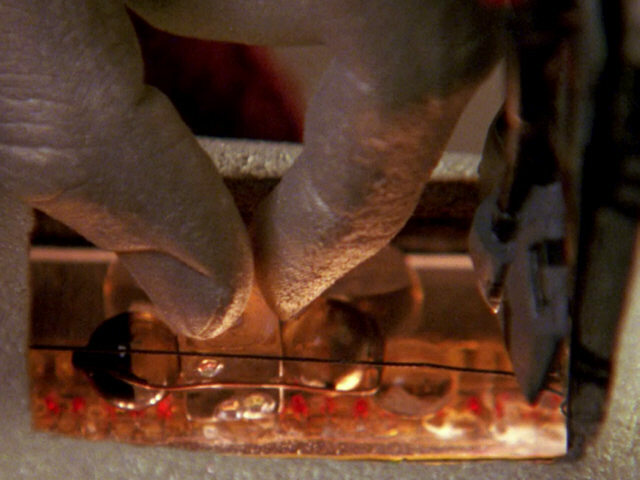 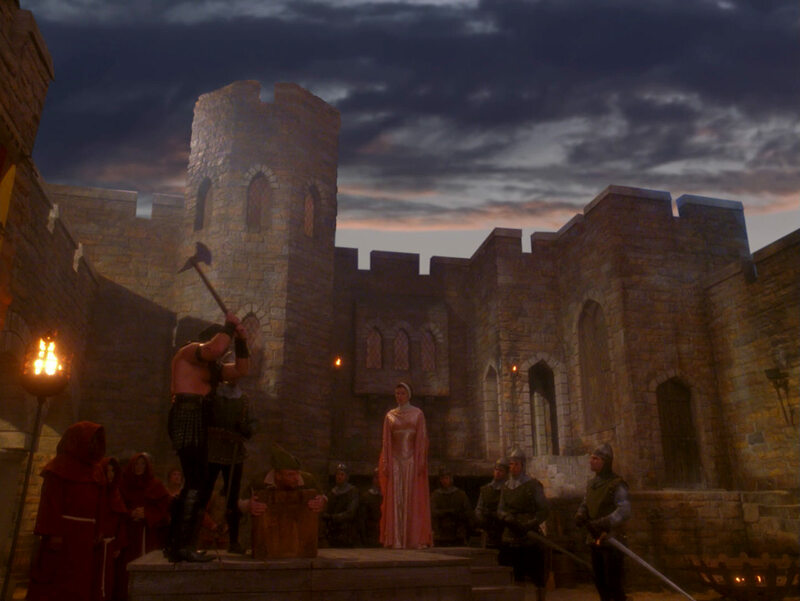 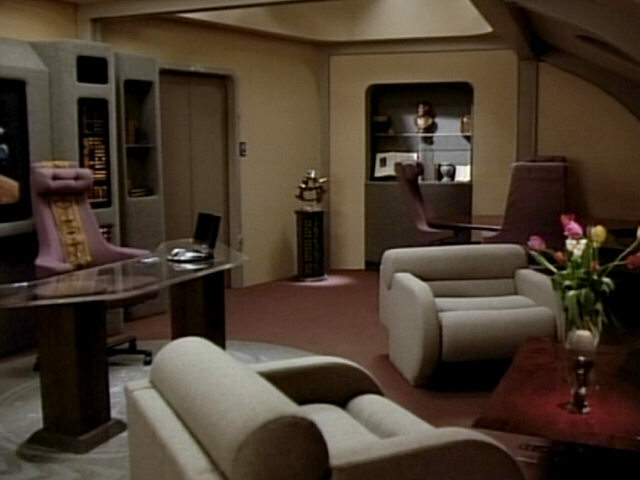 Ex Astris Scientia - Observations in TNG: "Qpid"
Here are some observations about sets, props and visual effects in TNG: "Qpid" without a specific theme, and a comparison of the original TV release (TNG) with the remastered episode (TNG-R). 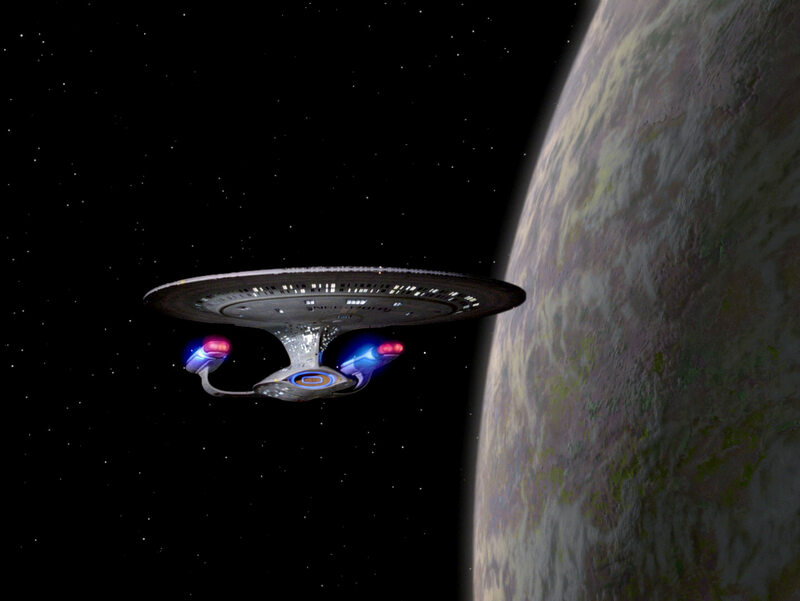 The USS Enterprise-D in orbit of Tagus III. 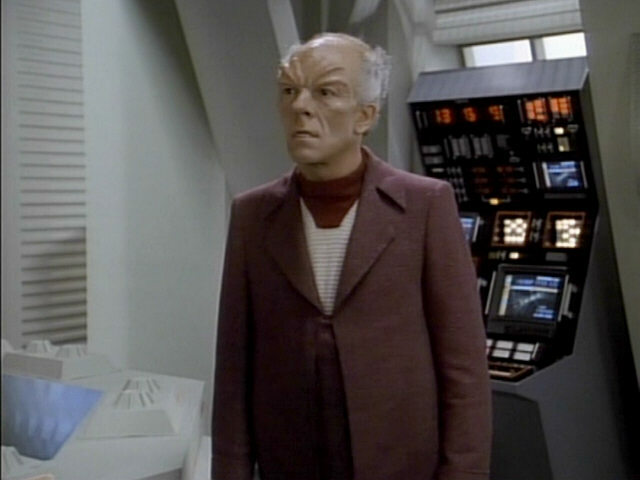 The planet was re-used several times on TNG and also appeared as Turkana IV in "Legacy" and Maranga IV in "Firstborn", for example. 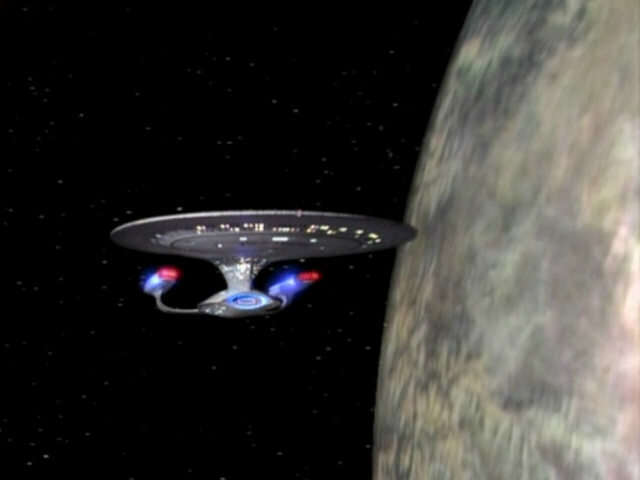 Re-Used Planets in TNG The planet is the same as in "Legacy" also in the HD versions of the episodes. 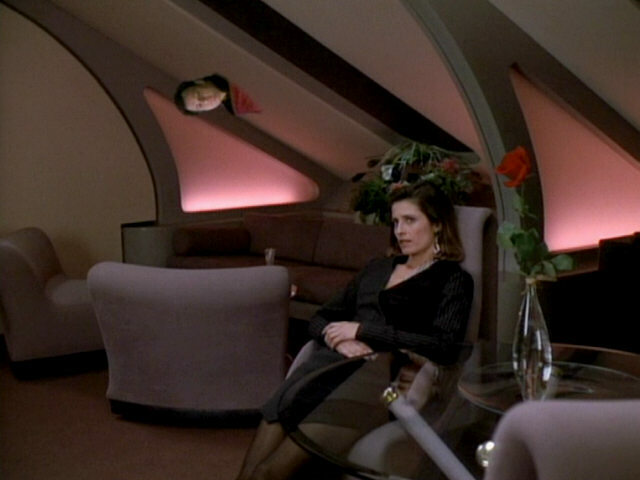 The hue of the planet was changed through. 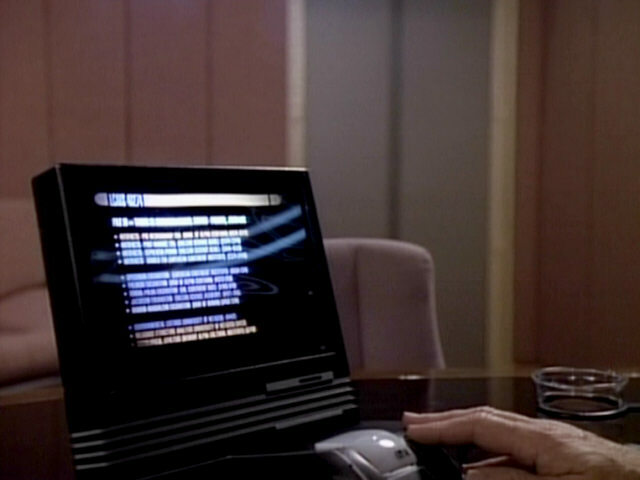 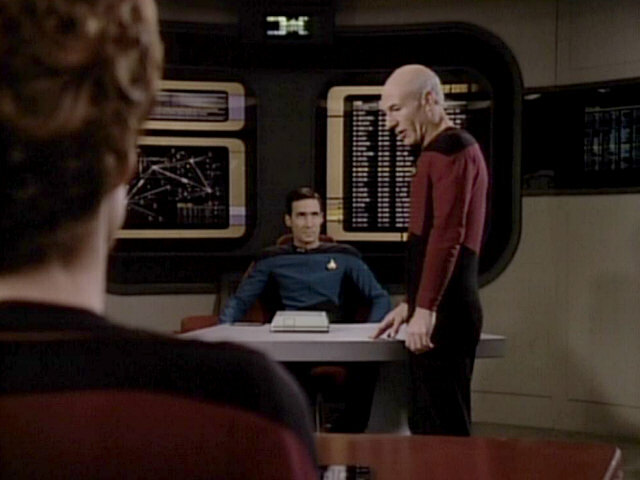 In HD, the text on Picard's desktop monitor is completely legible. 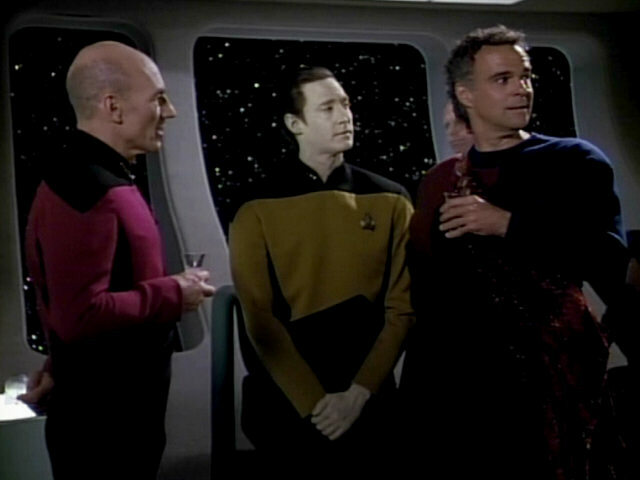 It contains numerous nods to people working on Star Trek at that time and also references the Vulcan Science Academy and American Continent Institute, both mentioned in TOS. 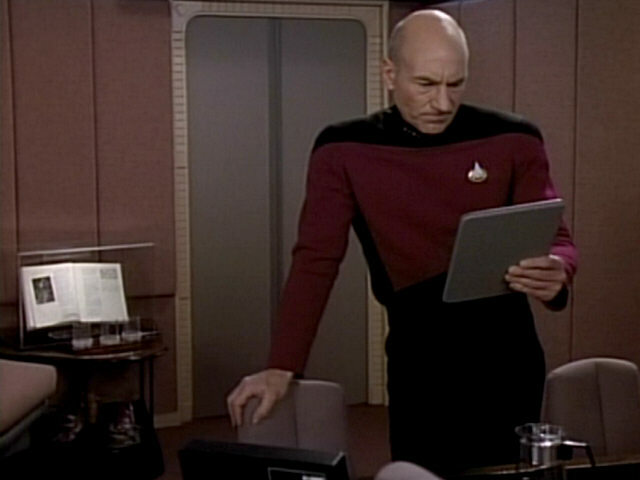 The PADD Picard is holding supposedly displays the keynote address he is writing. 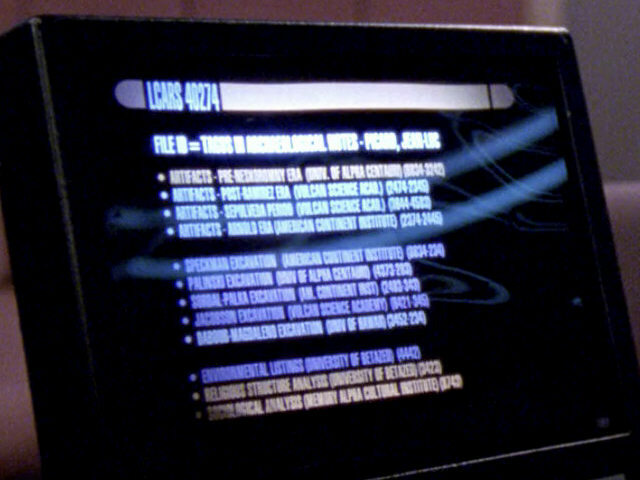 Although we can recognize more details, the text is far from readable even in HD. 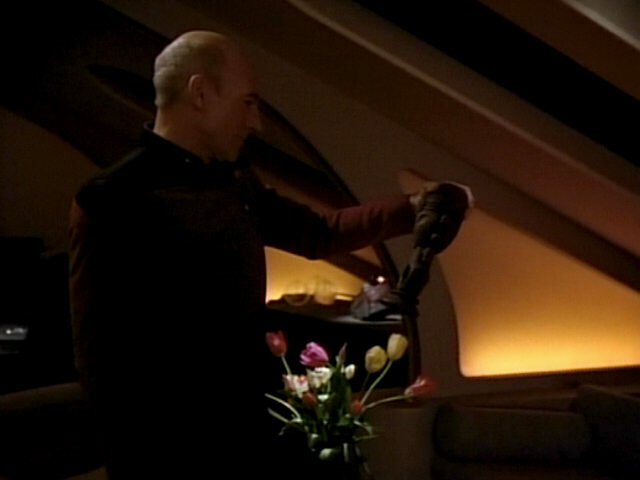 Picard's volume of the Annotated Shakespeare is opened at a very peculiar page in this and some later episodes. 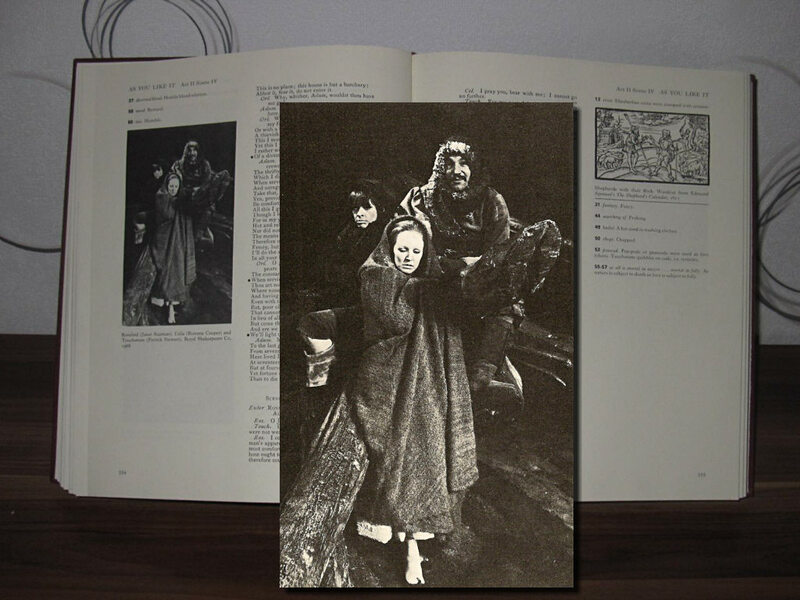 The picture on the left page is a photo from a production of As You Like It. 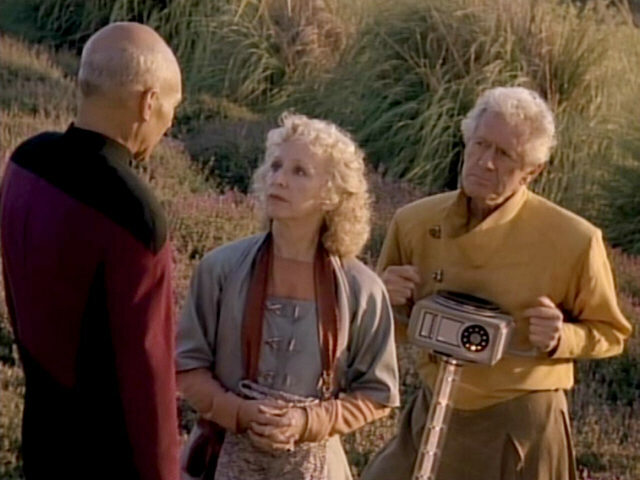 In the photo one can see Janet Suzman as Rosalind, Rowena Cooper as Celia und no one else but Patrick Stewart as Touchstone! 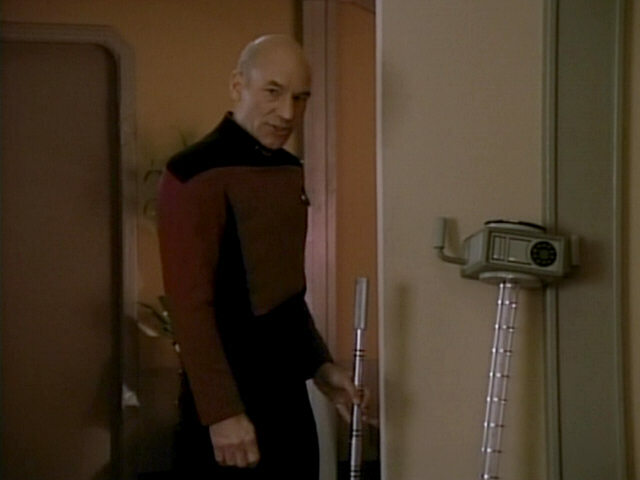 Patrick Stewart A better look at the pages in HD. 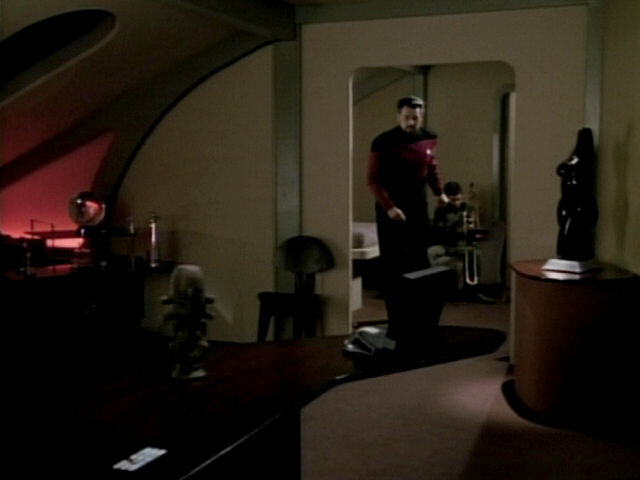 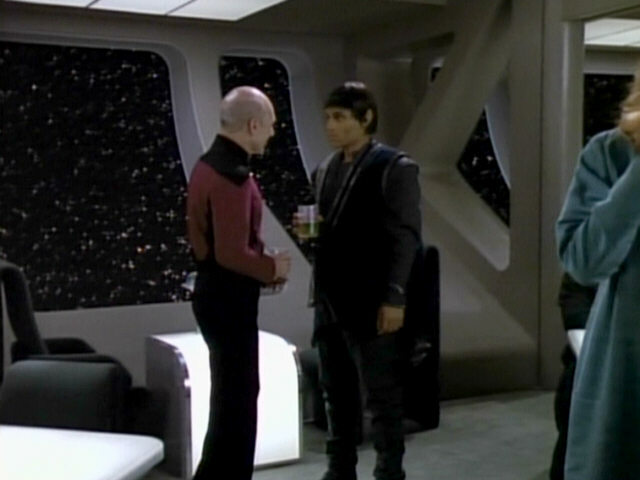 In the following scene, Picard enters his quarters. 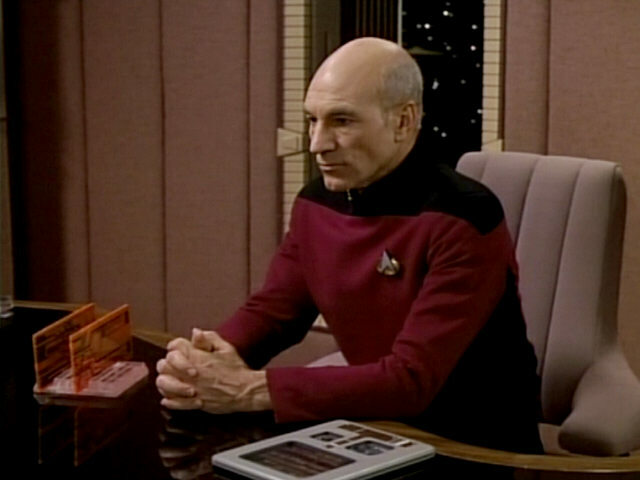 Curiously, his copy of the Annotated Shakespeare on display in his quarters is opened at exactly the same page, again showing a photo featuring Patrick Stewart. 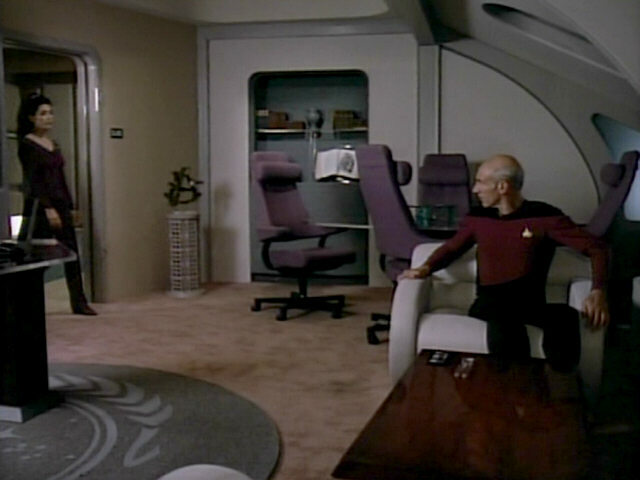 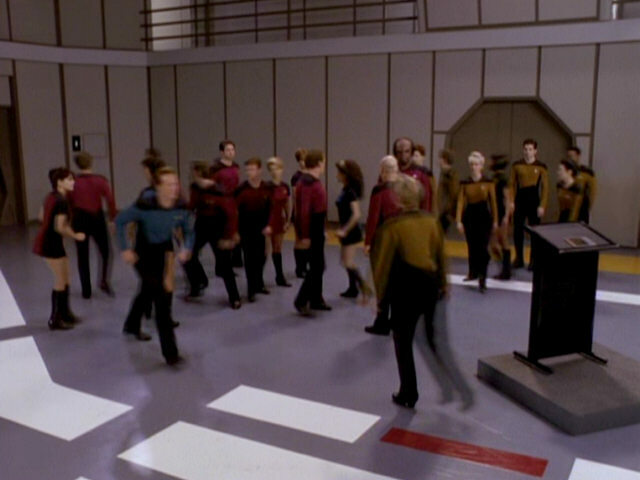 As can be seen, the circular carpet with the Federation logo, first seen at Starfleet Headquarters in "Conspiracy" and then in Picard's quarters in "Where Silence Has Lease", is seen under the captain's desk again. 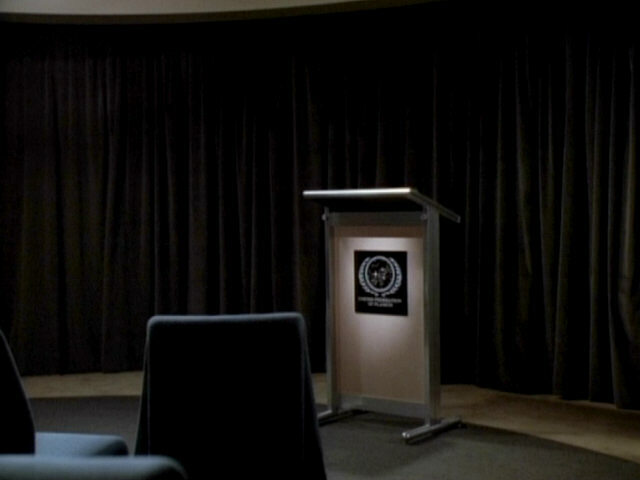 The bust of William Shakespeare, part of the set since the beginning of season 4, is present also. 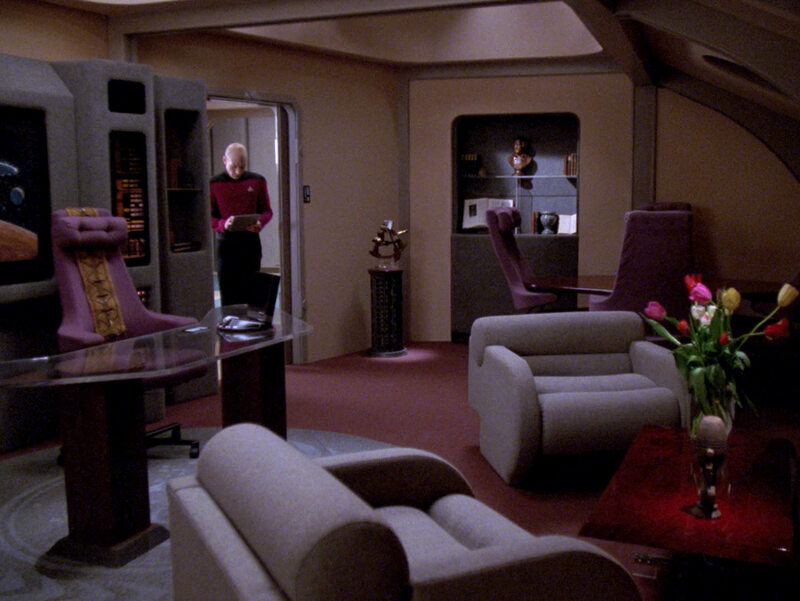 Has Lease" A good look at Picard's quarters in HD. 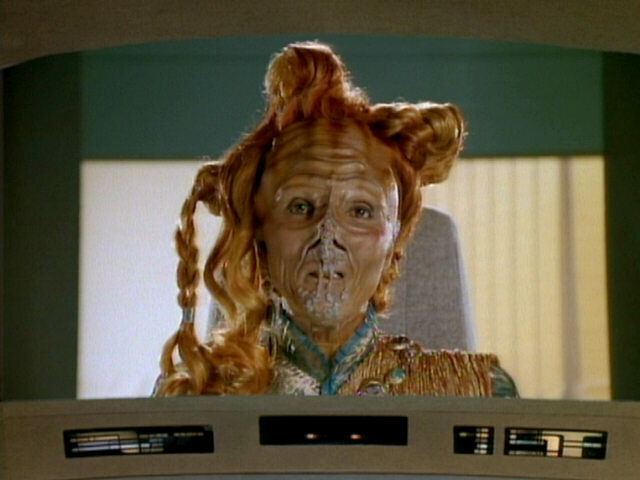 A horga'hn was last seen in Riker's quarters in "Future Imperfect". 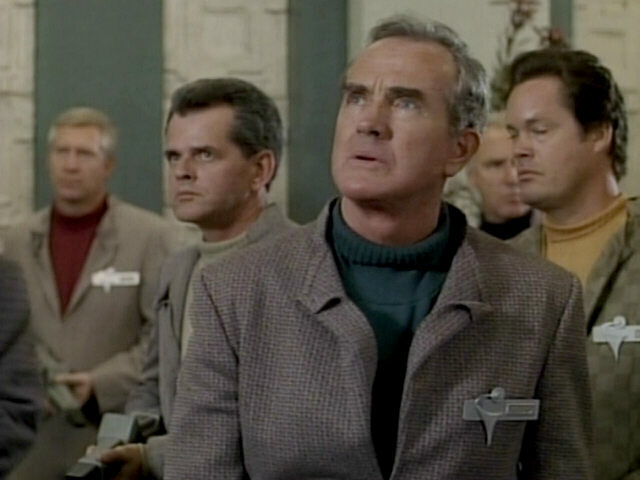 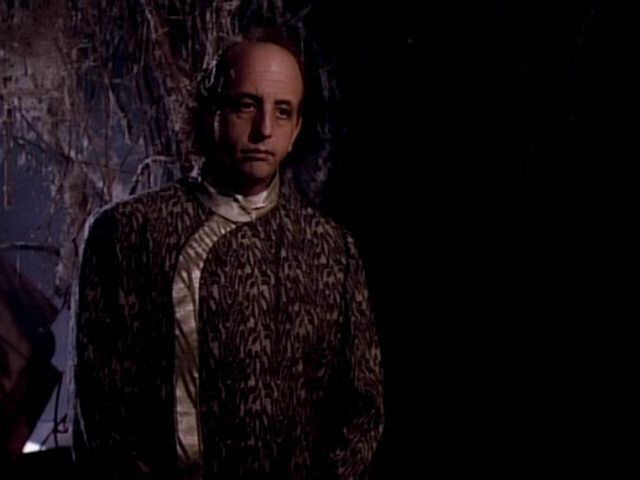 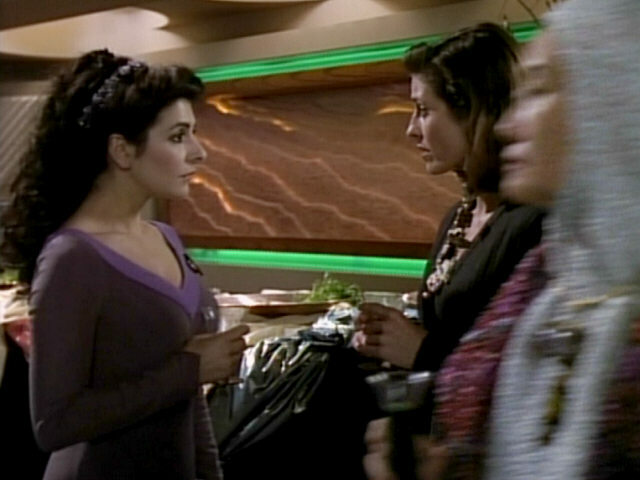 The archaeologist on the right wears a necklace previously worn by Premier Bhavani in "The Price" and later by Ambassador Taxco in DS9: "The Forsaken". 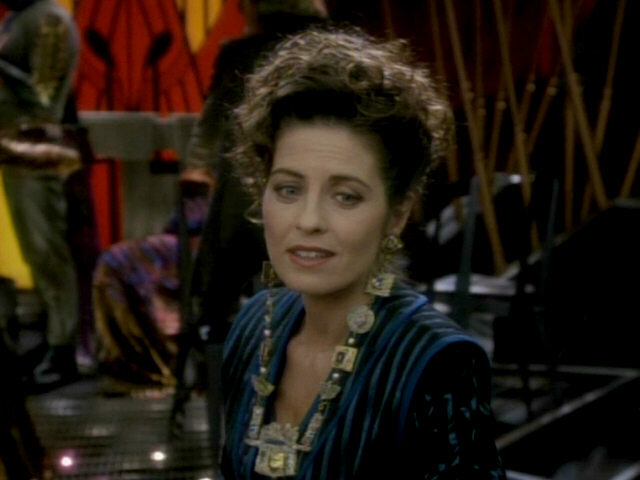 Vash wears the same earrings/necklace when she appears again in DS9's "Q-Less". 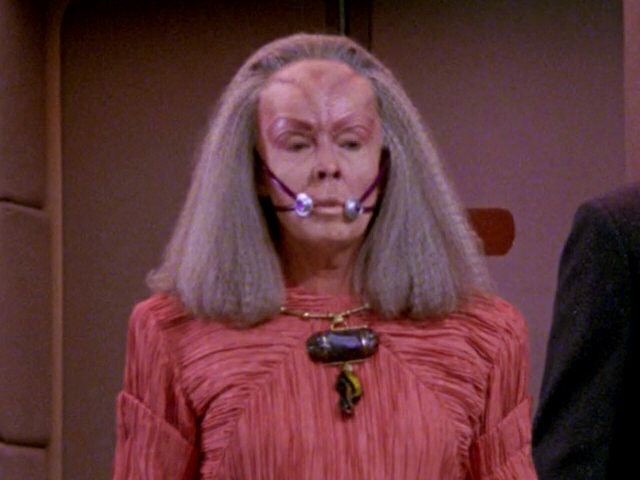 The Vulcan delegate wears the costume first worn by Ki Mendrossen in "Sarek". 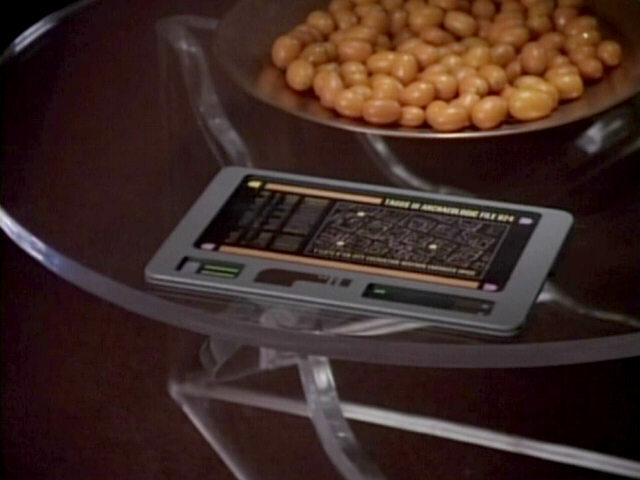 A better look at the PADD containing Picard's keynote address. 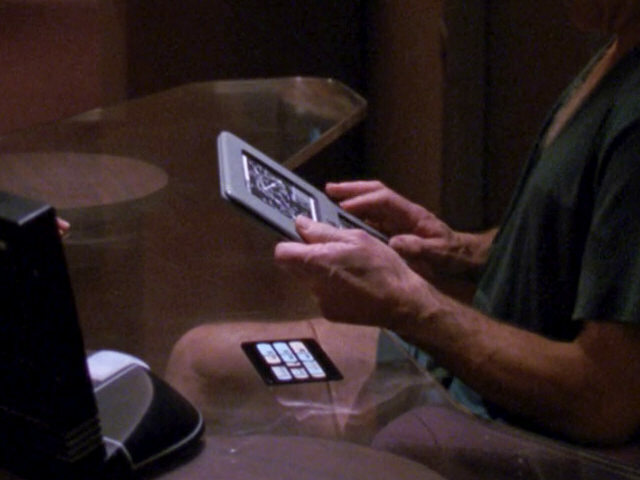 Once again, we can see the PADD a lot better but not read anything in HD. 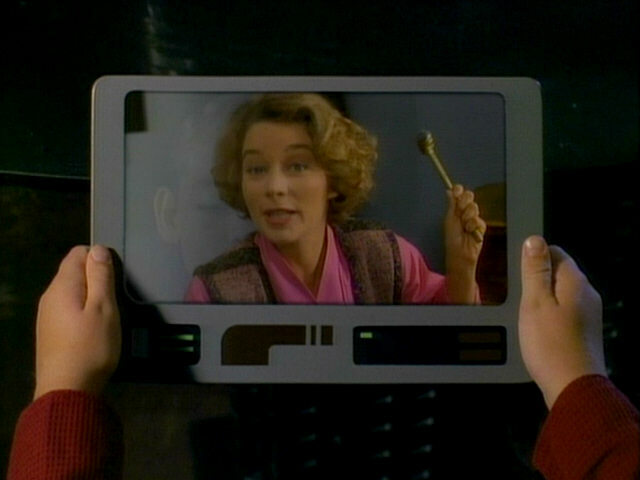 This PADD was originally created as the video-PADD used by Jeremy Aster in "The Bonding". 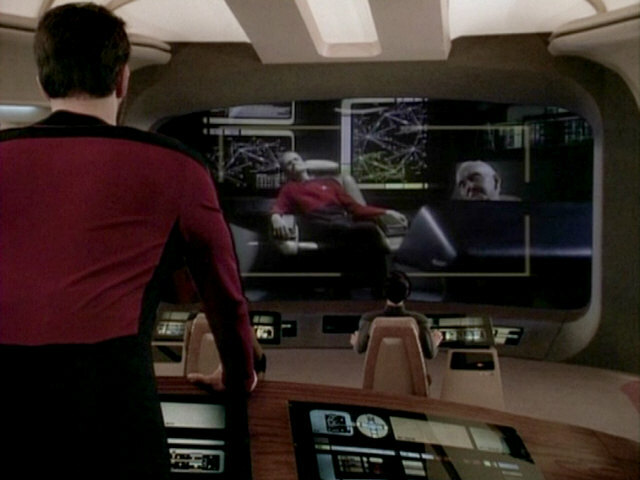 Amongst other re-uses, it also was seen in "Future Imperfect". 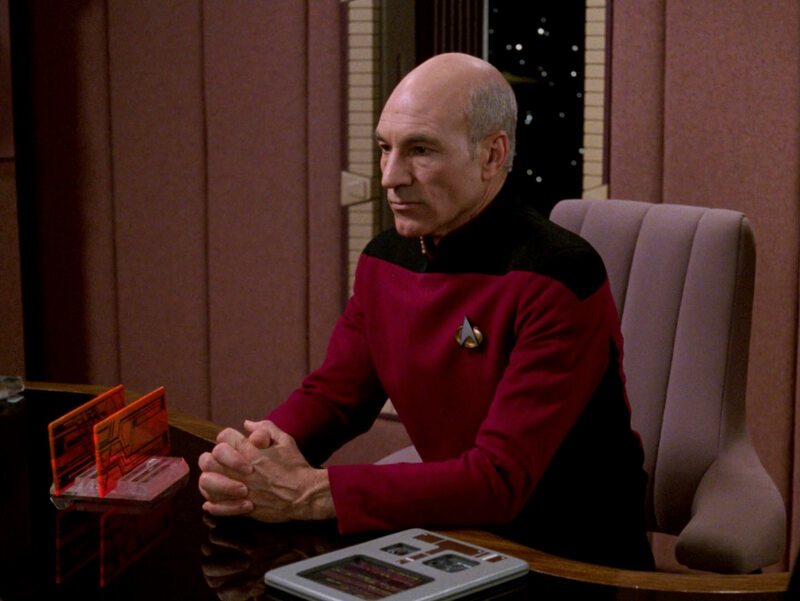 Imperfect" In HD, the text is fully legible and reads "Tagus III Archaeologic File 924 Y'zjete-H'ieh City Excavation Neutron Enhanced Image". 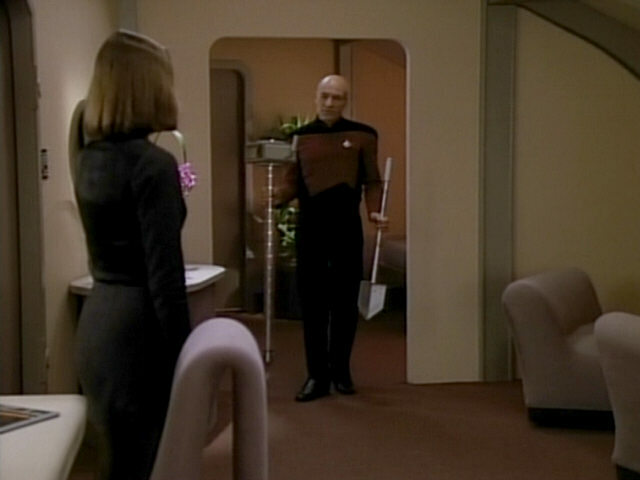 The shovel is the same one Vash and Picard used in "Captain's Holiday". 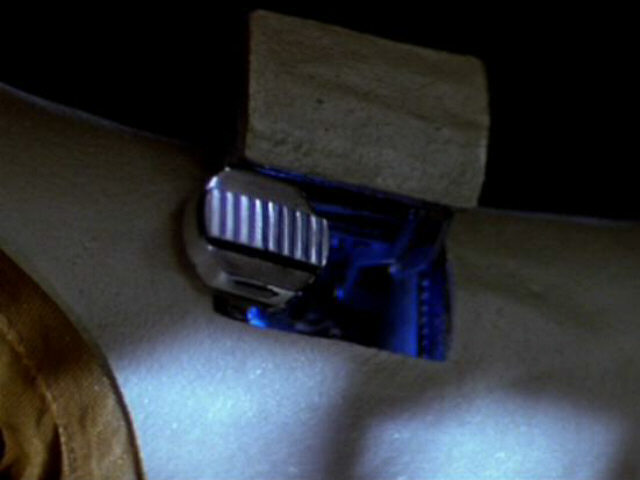 The other archaeological tool was previously used by Kevin Uxbridge in "The Survivors". 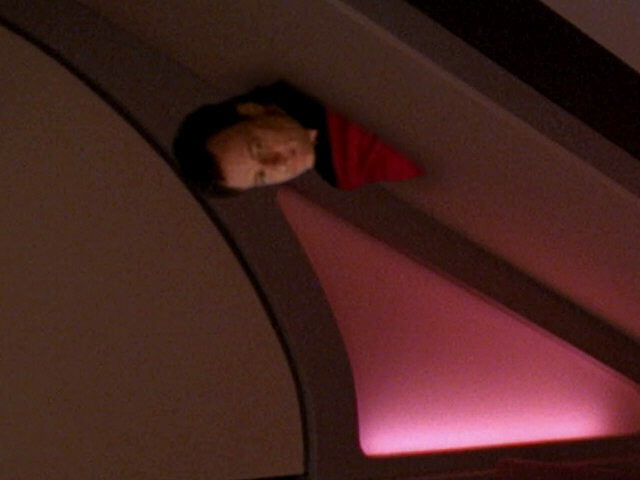 Q pokes his head through the hull just like Q2 did in "Déjà Q". 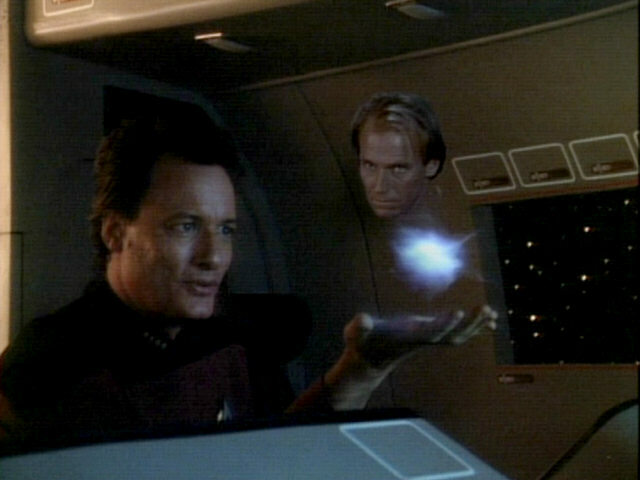 "Déjà Q" The effect in HD. 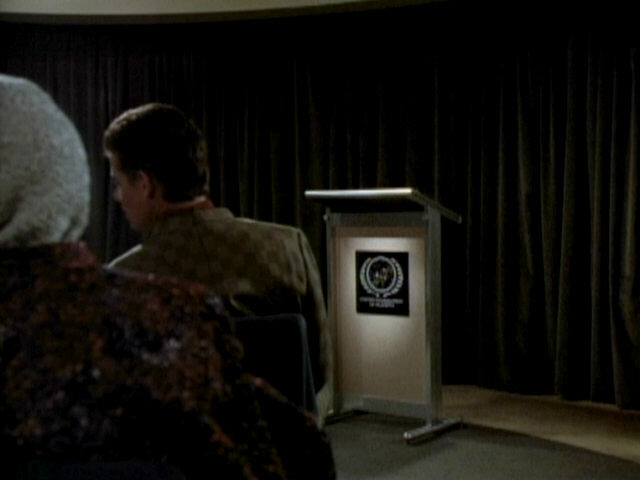 Note that Q's head was moved up considerably and scaled up a bit. 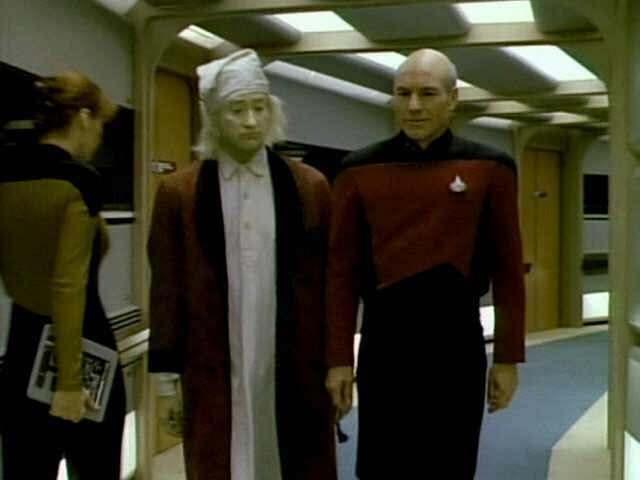 This was done to get the proportions relative to Vash right. 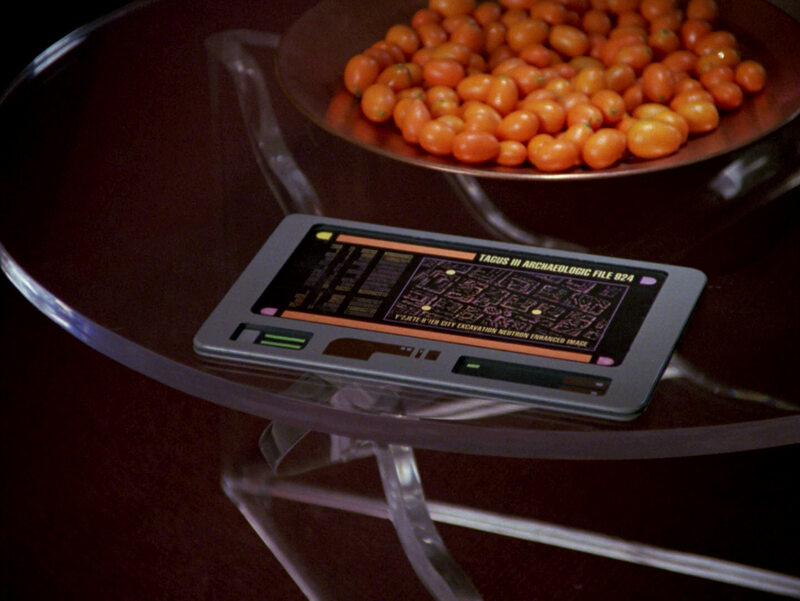 This PADD displaying a star map was earlier seen in "Devil's Due". 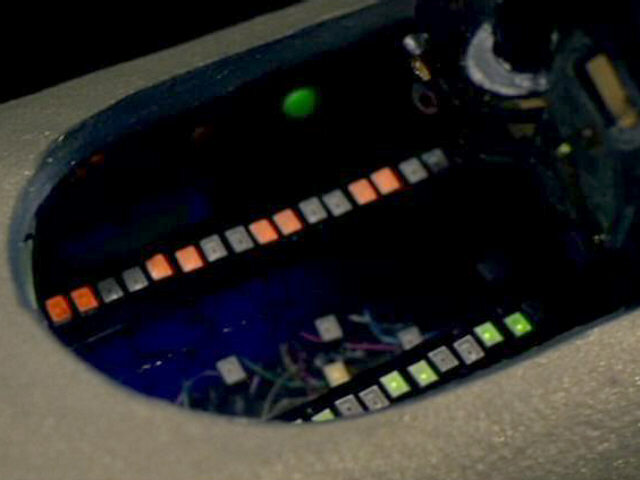 The star map was originally created for "Unnatural Selection" and also appeared in "The Measure of a Man" and "Future Imperfect". 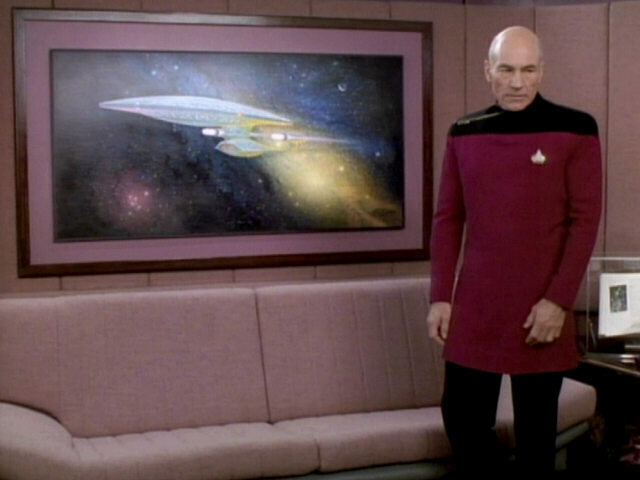 Imperfect" We can recognize the map a bit better in HD. 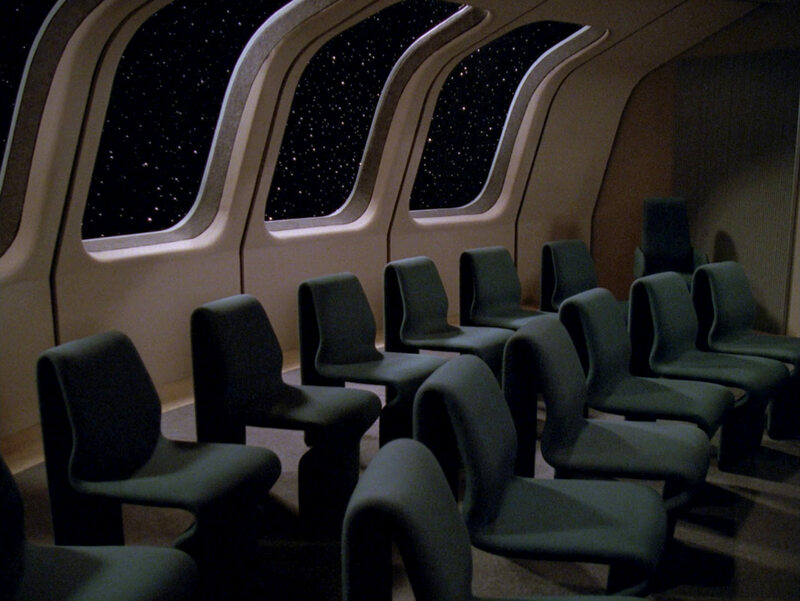 The meeting room is a redress of the observation lounge. 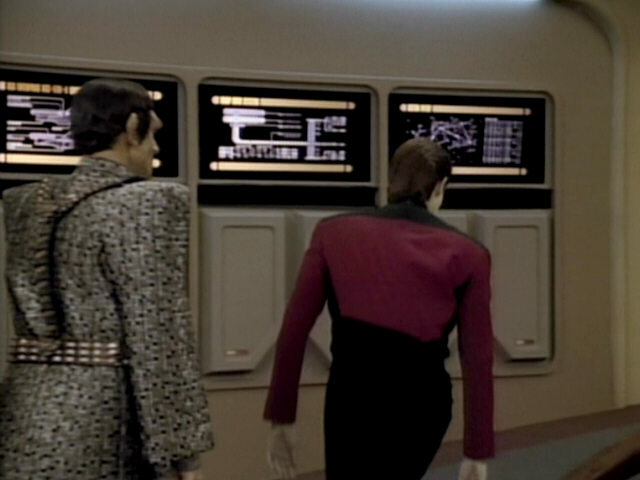 The port monitor was hidden, the control panel can still be seen, though. 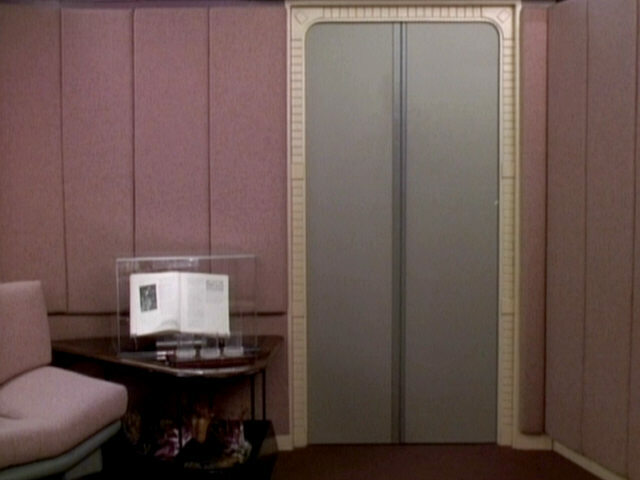 The wall with the golden starship models was removed and a simple curtain was placed here instead. 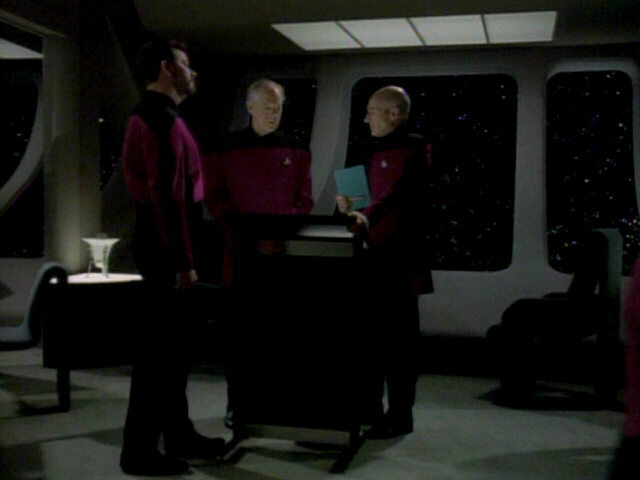 The same lectern (painted black) also appeared in "Chain of Command I" and "All Good Things". 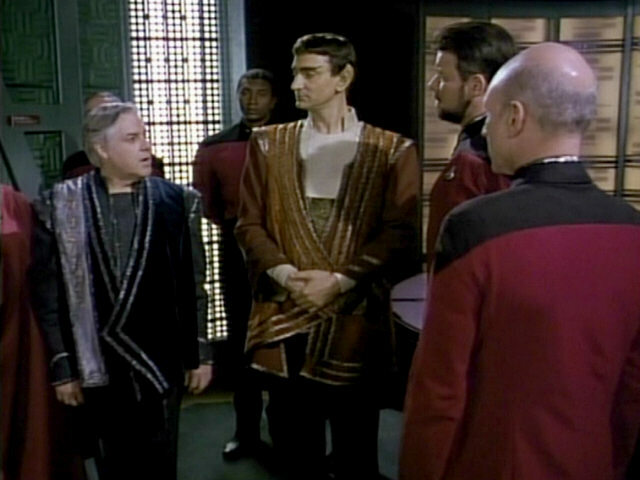 All of the members of the Archaeological Council wear costumes originally created for earlier episodes. 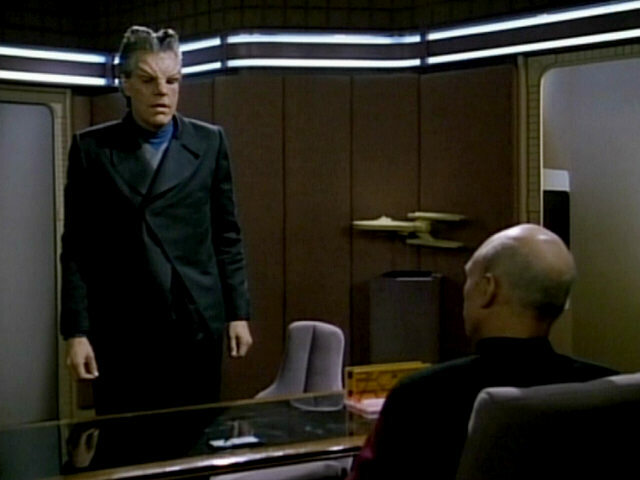 The human council member on the left wears an Angosian suit from "The Hunted". 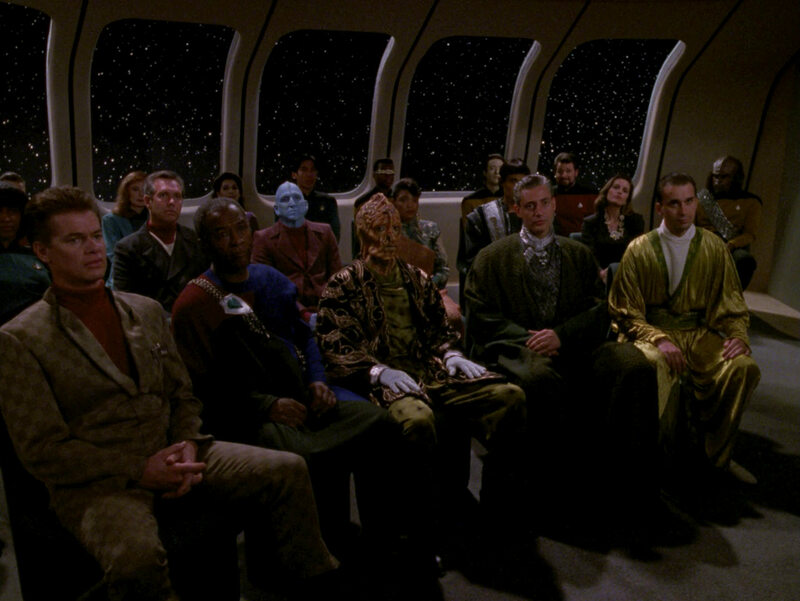 "The Hunted" A good look at the assembled delegates in HD. 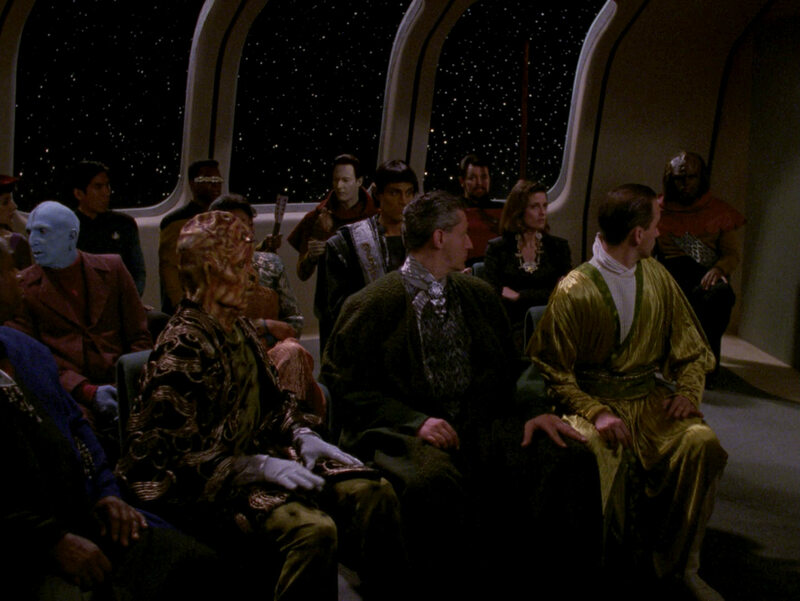 The delegate to the right of him wears Reittan Grax's costume from "Ménage à Troi" and Sovereign Marouk's sash from "The Vengeance Factor". 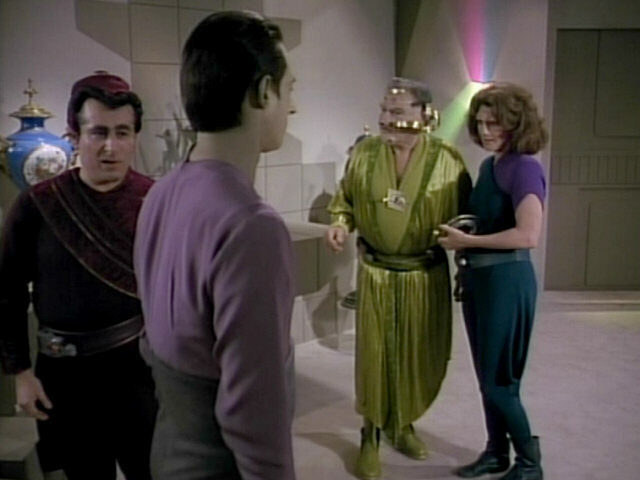 The Algolian has the same costume as the Algolian musician in "Ménage à Troi". 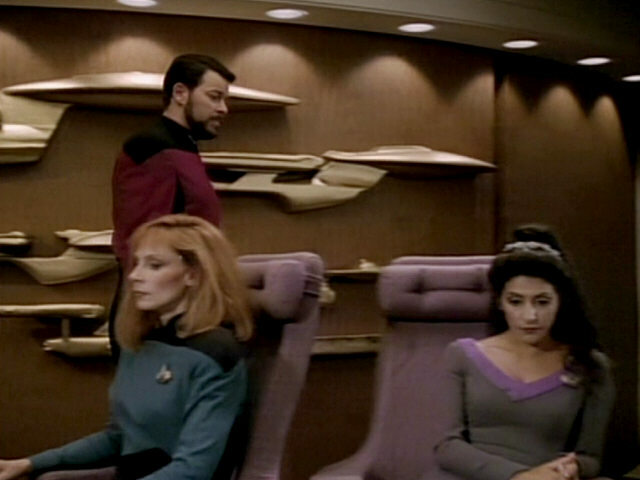 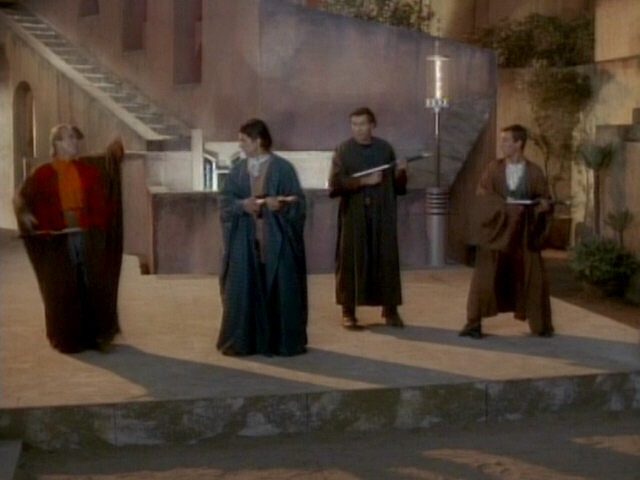 The human to the right of the Algolian wears a robe most likely seen on one of the settlers on Tau Cygna V in "The Ensigns of Command". 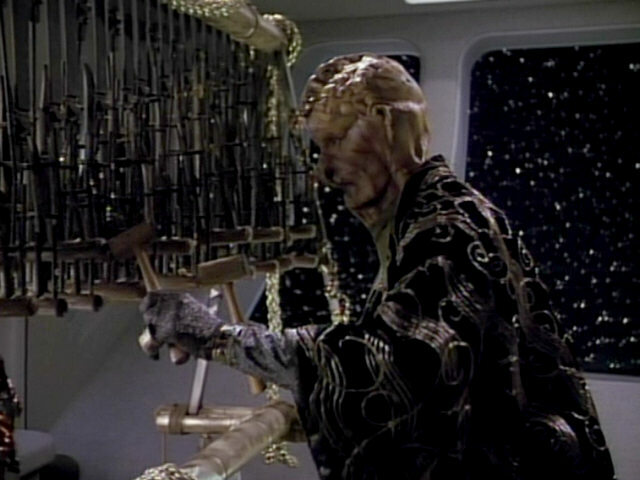 Underneath, he wears the shirt of the Minosian peddler in "The Arsenal of Freedom". 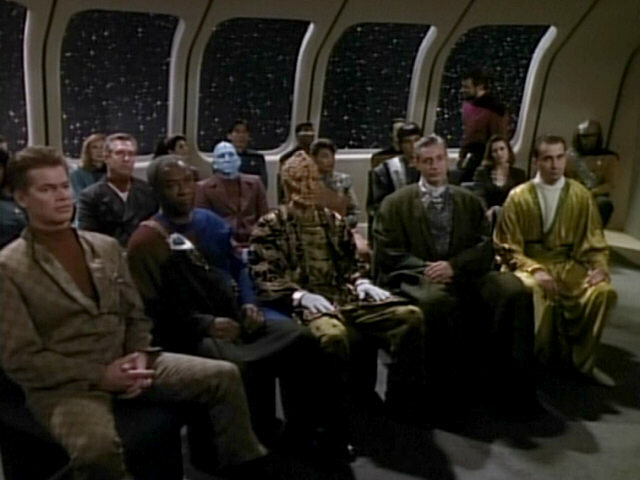 The human at the very right of the front row re-uses Palor Toff's costume from "The Most Toys". 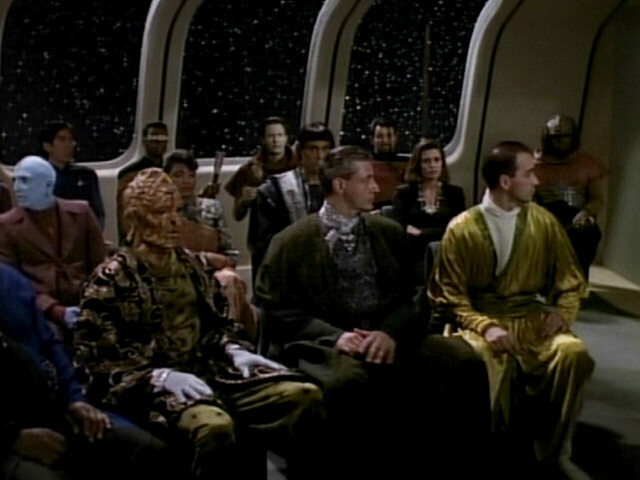 The human and Bolian council member in the second row wear Krag and Nel Apgar's costumes respectively from "A Matter of Perspective". 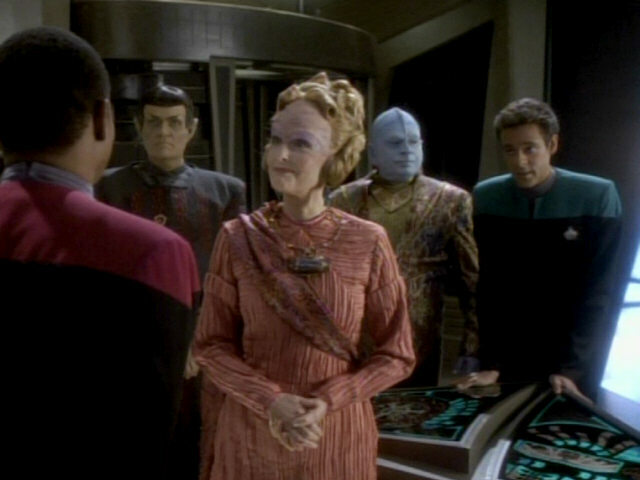 The human female wears Chairman Songi's costume from "Final Mission". 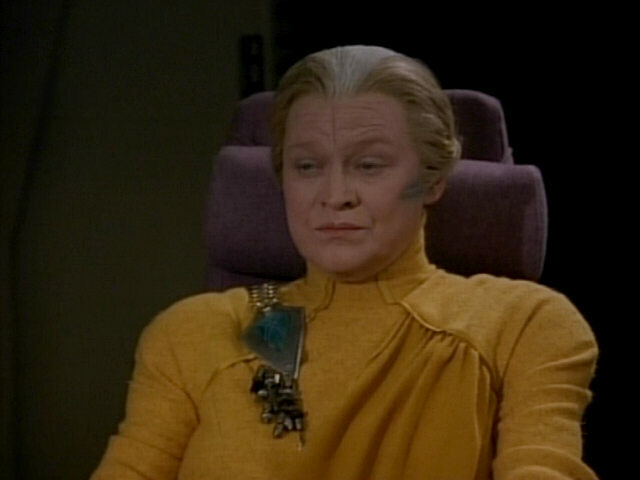 The Vulcan, finally, has put on Ki Mendrossen's costume, as has been mentioned earlier. 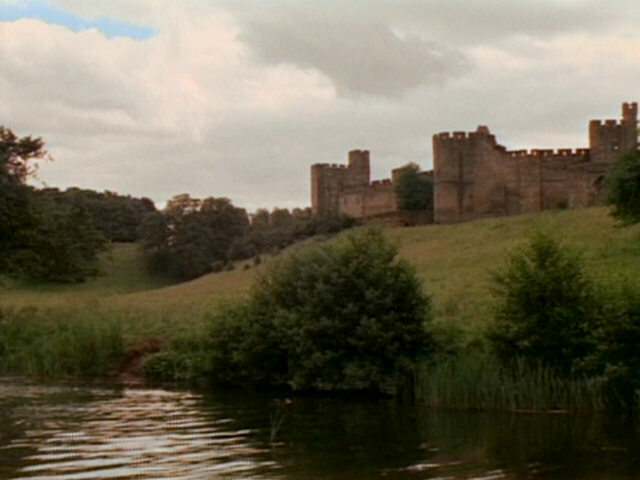 This footage of Nottingham Castle actually shows Alnwick Castle and the river Aln. 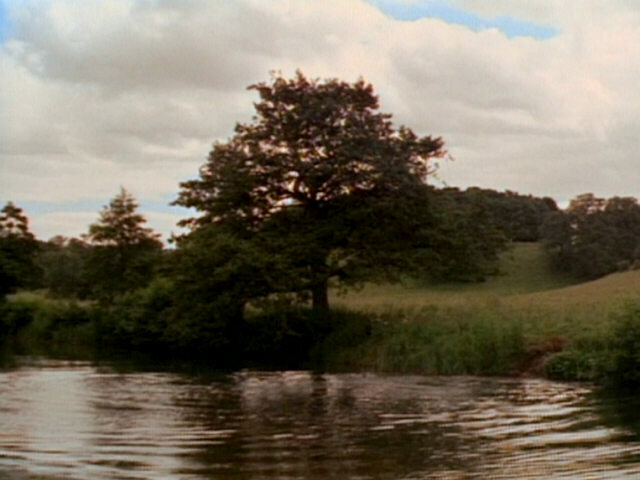 The location shots in HD. 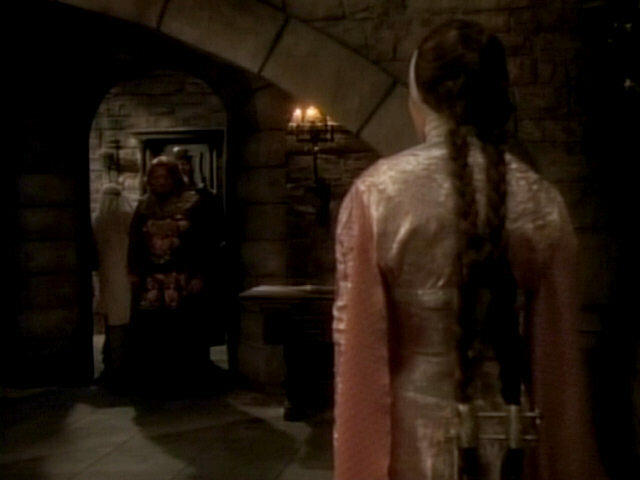 Vash/Maid Marian's hairclip is similar to one worn by Nuria in "Who Watches the Watchers". 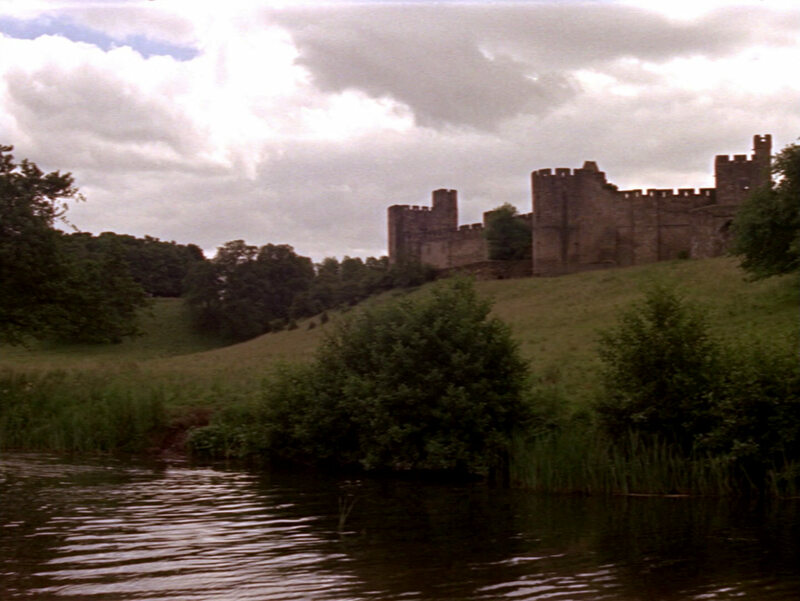 A good look at the extensive Nottingham Castle exterior set. 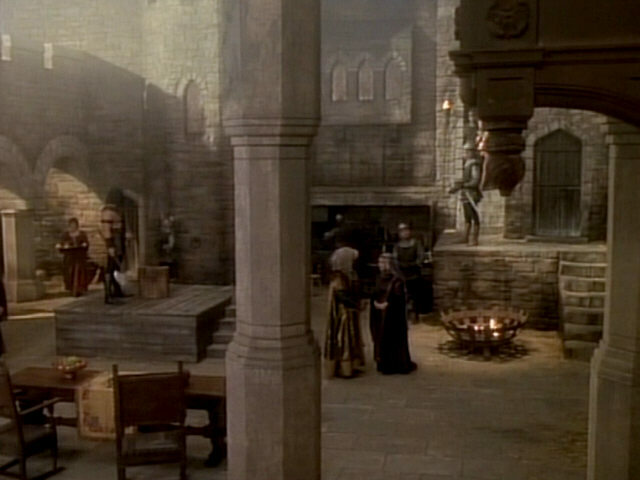 A good look at the courtyard in HD. 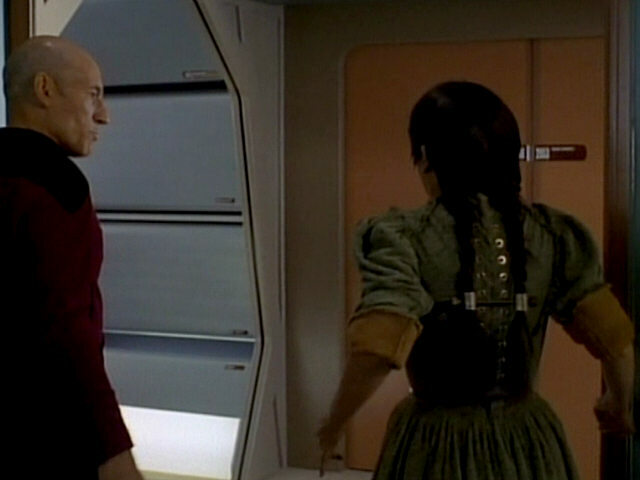 Data also opens parts of his forearm in "The Ensigns of Command" (the same fake arm was used here), "Star Trek: Generations" and "Star Trek: Nemesis". 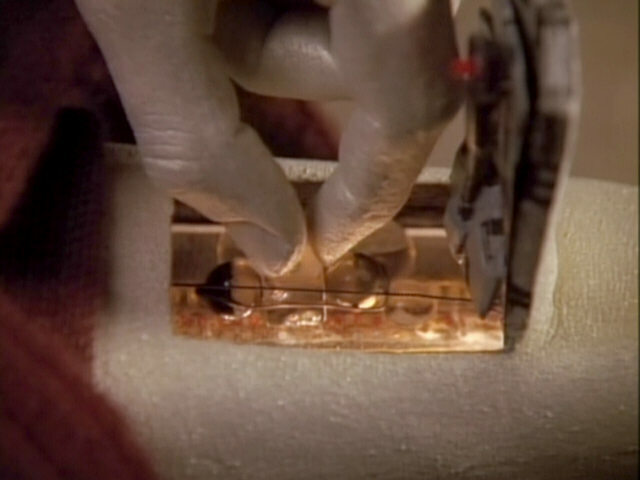 "Generations" A better look at Data's innards in HD close-ups. 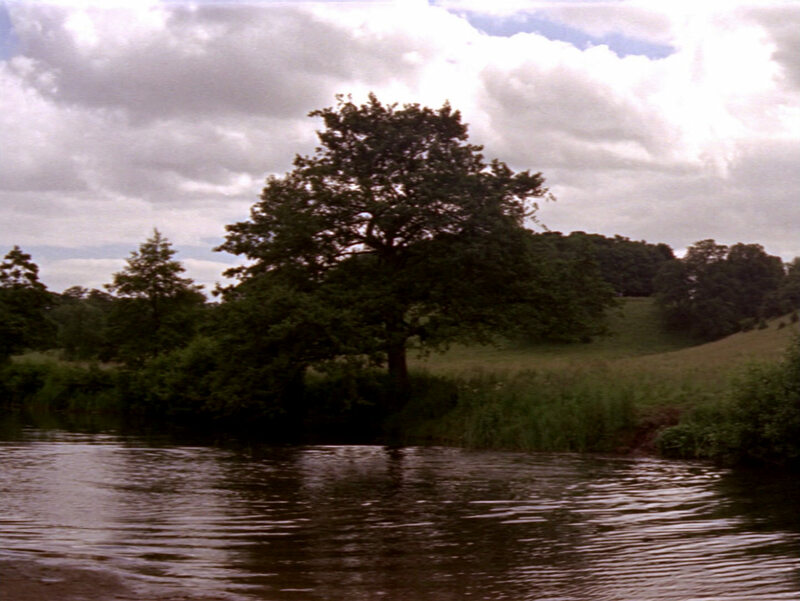 The sky in the background was added in post production for this shot. 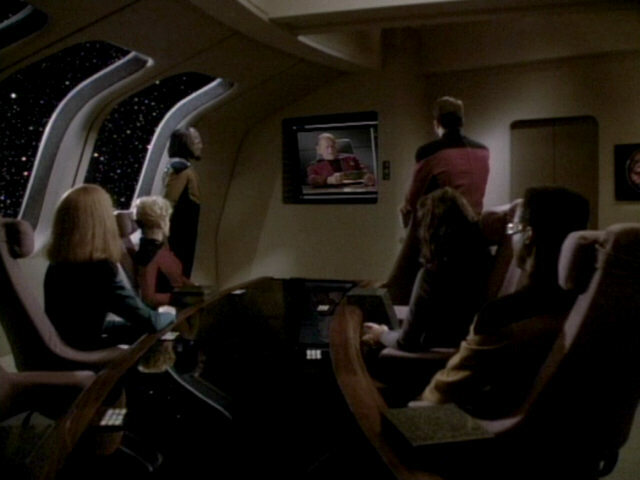 In the HD version of the episode, different footage of the sky was inserted, the scene also looks much more natural now. 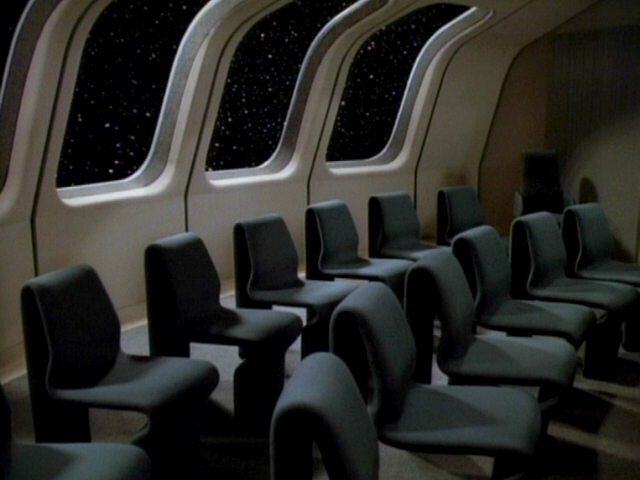 A good look at the empty meeting room, a modified observation lounge. 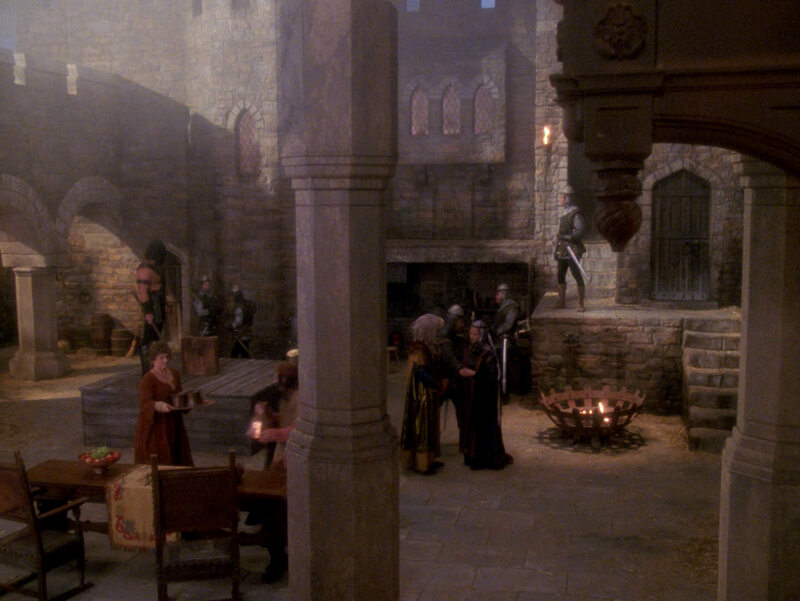 A good look at the set in HD. 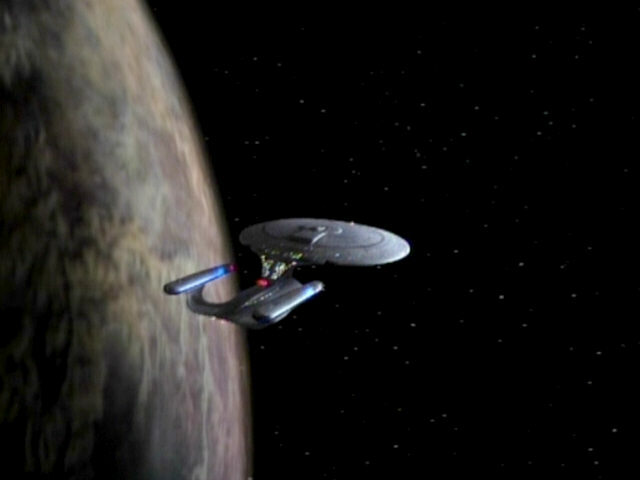 Another shot of the USS Enterprise-D in orbit of Tagus III. 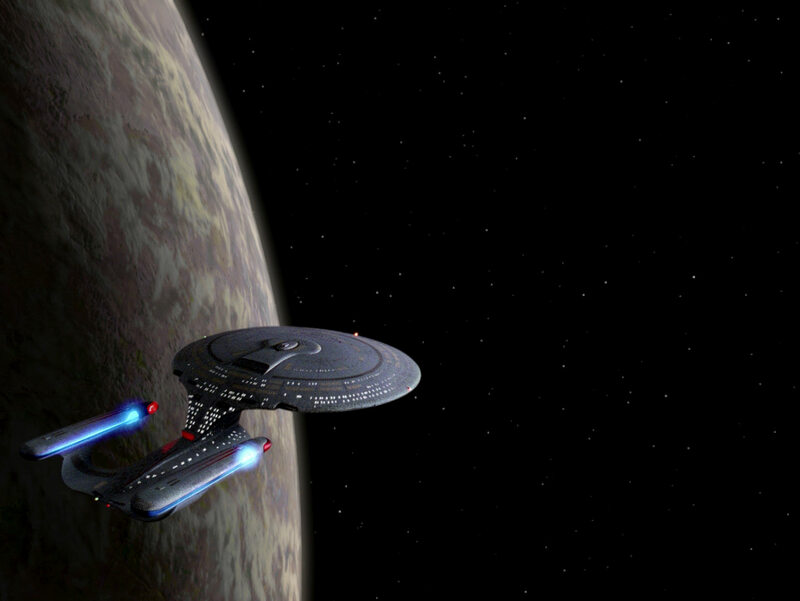 A good look at the remastered planet. 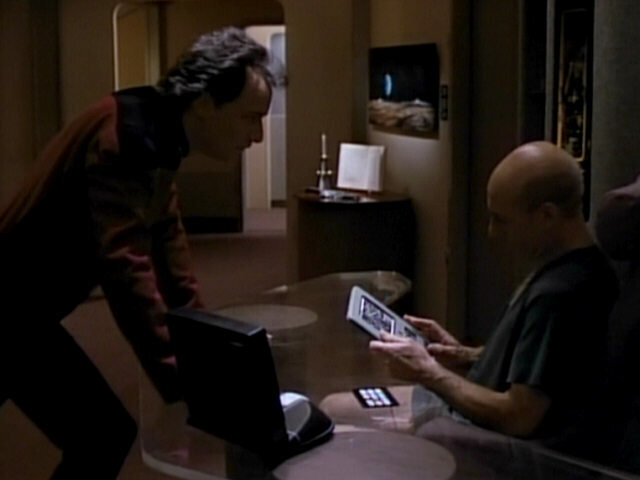 Picard's copy of the Annotated Shakespeare, open at a page showing a photo of Patrick Stewart, can be seen well in this shot. 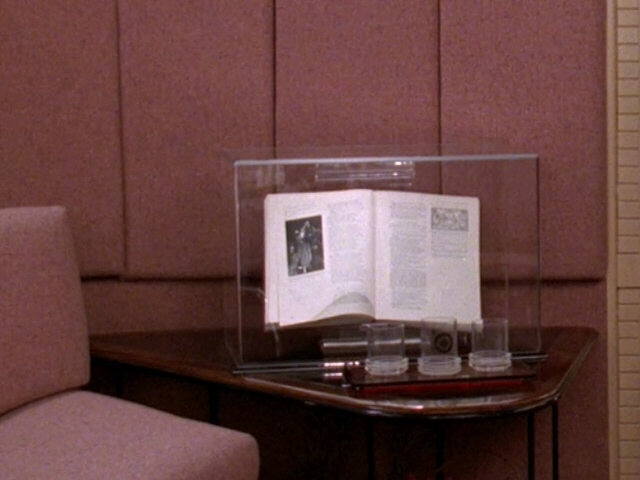 Once again, the page is clearly identifiable. 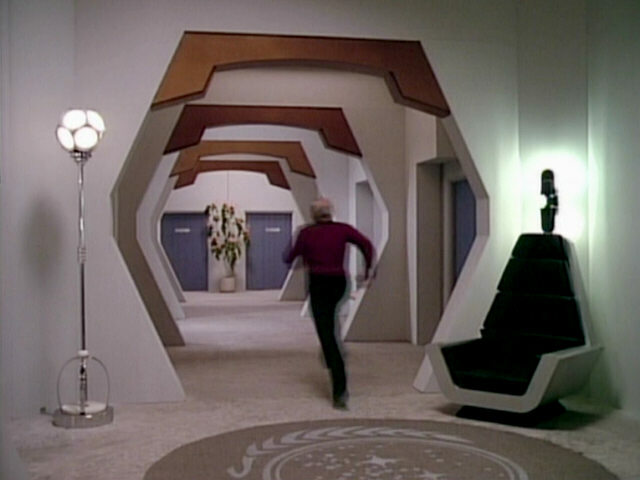 Thanks to Damir Dzhafarov for bringing up the issue of Q's head in the wall.